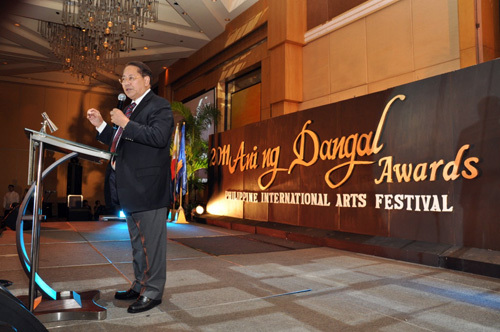 ANGARA AT 2011 ANI NG DANGAL AWARDS: Senator Edgardo J. Angara spoke as the guest of honor in the NCCA’s (National Commission for Culture and the Arts) 2011 Ani ng Dangal awards ceremony held last night at the Sofitel Philippine Plaza Hotel. The awards night is the culminating activity for the Philippine International Arts Festival (PIAF) as part of the National Arts Month celebrated every February. “It is important for us Filipinos to remember that we have produced brilliant minds and great people who inspire us,” he said, addressing the awardees from cinema, dance, literary, music, visual arts and multi-disciplinary arts.